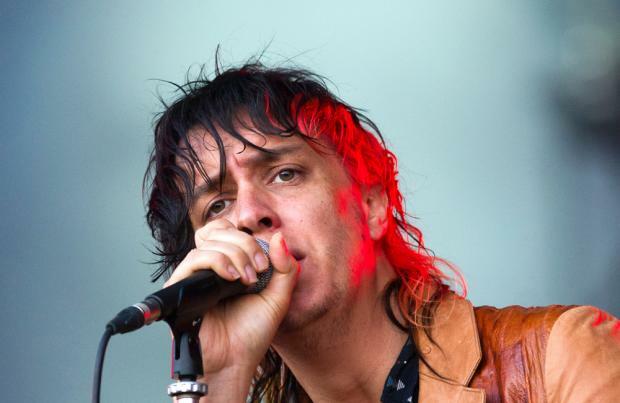 The Strokes frontman Julian Casablancas has admitted the group will record a sixth studio album "if the collective can be summoned and caroused"
The Strokes have dropped a huge hint they are set to record a new album. Julian Casablancas, the band's frontman, admitted the group - whose last record was 2013's 'Comedown Machine' - will start working on their sixth studio album "if the collective can be summoned and caroused". The Strokes premiered a new single, 'Threat of Joy', on BBC Radio 1 on Thursday night (26.05.16) and Julian said the band - who didn't take their latest album on the road - could be touring again soon if they record their sixth album. Speaking on the Annie Mac's show, he said: "I don't think there's anything planned, but, I mean, we always do stuff. "No specific news, sorry. It's never... I feel like we play every year or two years or something like that. I think the idea was if we can get our stuff together to do a record, we can do more proper tours." But the 37-year-old singer admitted he is "in a bubble" and tries to avoid the commercial side of the group's music once it has been recorded. When asked if it felt good to release music again, he replied: "I mean, sure, I don't know. I'm in a bubble. I don't know, I try not to pay attention. I worked on it and it's done. I don't, like, check the internet or anything." Last year, The Strokes - who are also made up of Nick Valensi (guitar), Albert Hammond, Jr. (rhythm guitar), Nikolai Fraiture (bass) and Fabrizio Moretti (drums) - headlined a Barclaycard Presents British Summer Time gig at London's Hyde Park in June. They were also spotted at a recording studio in Monterrey, Mexico, in 2015 where they were thought to be working on new material. The band's 2001 debut album 'Is This It' went to number two in the UK Albums Chart, while single 'Last Nite' peaked at number 14 in the UK Singles Chart.